AP ImagesHe came to the US over 25 years ago with $US50. Today he owns more than two-dozen restaurants. 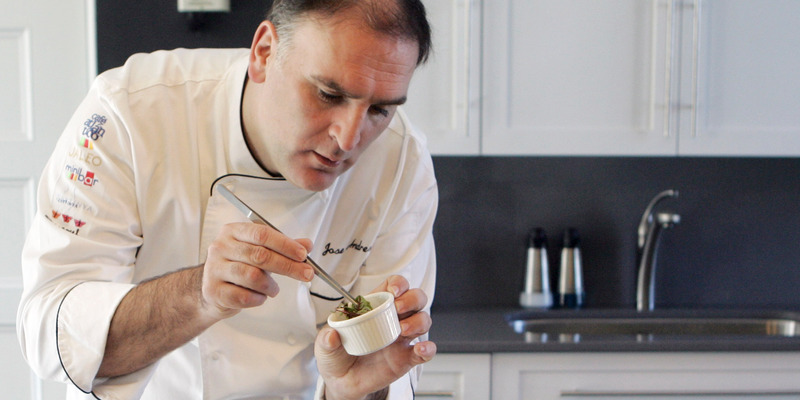 José Andrés is a celebrity chef known for helping to popularise tapas, or Spanish small plates, in the United States. 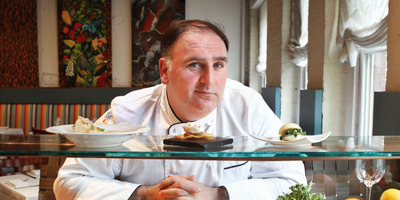 Andrés has more than 25 restaurants and has won numerous awards, including two Michelin stars and the 2015 National Humanities Medal from President Barack Obama. He made headlines for a lawsuit with President Donald Trump after Andrés decided not to open a restaurant in Trump’s Washington, D.C. hotel. The lawsuit was settled in April. Since then, Americans have warmed up to Spanish small plates and Andrés has gone on to lead 26 restaurants and win two Michelin stars. He even claims to have created the best Philly cheesesteak. “You’ll eat the Philly cheese steak in two bites and your life simply would change forever,” he said. In April, Andrés was invited to speak at the Masters golf tournament in Augusta by Intersport for a summit on leadership. On this edition of “Success! How I Did It,” Andrés talks about his life, how he manages his kitchen, and why he pulled out of the Trump International Hotel. The following is a transcript of the podcast, which has been lightly edited for clarity and length. 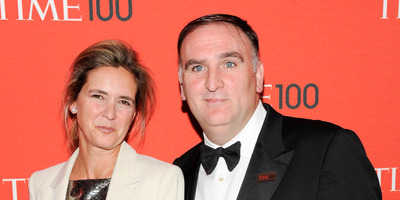 AP ImagesAndrés says his wife, Patricia, has had her recipes printed in The New York Times more than he has. Alyson Shontell: I want to talk about how you’re running your kitchens and you’ve created this empire. But the big question everybody has is, how do you go from being a good cook to being a celebrity chef, world-renowned, and super successful? José Andrés: Well, we have a problem here, because every time they say “world-renowned chef,” if you have to put the “world-renowned” in front of “chef,” it means a chef is not world-renowned, period. Shontell: How do you figure? Andrés: Or anybody else. When you are at home and you’re cooking and your daughters tell you, I think your over-easy eggs are overcooked, Daddy. That brings you down to reality, right? The best dishes I have are all from my wife, who’s here with us in the audience, Patricia. Her recipe has been printed more times in The New York Times for gazpacho than any of my recipes. I’m like, really? I mean, it’s the only two dishes she knows how to cook. I’m sorry I’m sharing. So the question was? Shontell: I want to go back to the formative years when you were a kid. Was there some moment when you realised, “Hmm, I’m better than the average chef — I’m actually a good cook”? Andrés: An important moment is a story I love to tell because I realise the power of this story, at least to me. Later, all my life, had to do with fire itself. My father, who was a nurse, loved to cook. Every man in Spain loves to cook. Usually the woman’s cooking is better, but the man loves to cook. Shontell: They love to try. This, to me, is a very powerful story because it’s beyond cooking. It’s a story that goes on exactly who we are, where we want to go, where we come from, and sometimes we want to do the cooking, but we don’t know what the heck is our fire. I always ask myself, “What’s my fire today?” Then the cooking is so simple. Shontell: It sounds like your father was a really great influence, despite whether he could cook or not. He made a mean paella, which you would help with. And then you worked in a restaurant in Barcelona that was very famous. Shontell: And you went to culinary school. Andrés: It’s probably the best restaurant in the history of mankind. Andrés: It’s an unbelievable restaurant. It’s the best restaurant. I was very young when I went there. I was roughly 15 going on 16 and met a fascinating guy. He’s a guy who says one day, after he went to a conference, he’d heard the French guy said, “To create is not to copy,” then he went back to his restaurant, put away all the books, and he began creating. That’s a very powerful word. It’s what keeps you going. To create is not to copy. Shontell: That’s a powerful phrase. How did you put that into practice? Like, how many hours did you spend cooking growing up? To become the best in anything, you need to put in tons of work. So how did you do that? Andrés: Creativity starts in many ways, and usually with creativity we all go to the same places, the places we know, the places we are comfortable. I heard this amazing phrase — I don’t know who said it — and I’ve been using it nonstop, which is, “Life starts at the end of your comfort zone.” Think about it for a second. In life, in our professions, if we move away from our comfort zone, it’s when things really start clicking and happening. And sometimes we don’t realise that to innovate and to create, we try to be too bold and try to bring the most cutting-edge technology or the new ways to do things, and sometimes everything is in our fingertips in front of our noses. We don’t stop for a second briefing and try to find the answers to the simple things that we have in front of us that actually we’re very good at. But we try to run quicker, run faster. Do strange things with things we don’t even know what they are. Snapchat, anyone? I mean, give me a break. So that’s what we do. We asked ourselves, “What can we do with this that’s never been done before?” We work hard on them until we begin getting answers. That’s what we do. 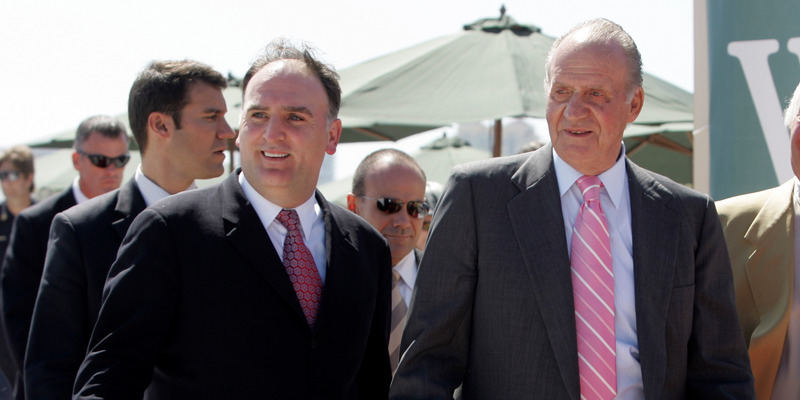 AP ImagesDecades after serving in the Spanish navy, Andrés walked with Spain’s King Juan Carlos at the South Beach Wine and Food Festival. Shontell: Going back a little bit to growing up, for you and the Spanish navy. You were a cook, right? First off, what was that experience like? Andrés: Well, in Spain, everybody had to go to serve the country — in the old days, not anymore. I think it’s unfortunate because I do believe for young boys and girls it’s so, so important. It’s good to serve your country through the army or through the navy or through any social enterprises that you can be helping your community. It gives you a sense that the country is yours and that it’s yours to fix it and it’s yours to make it better. For me, the navy was probably a changing point in my life. But I have learned in life that if you knock on the door, and they don’t open you the door, you keep knocking, and if not, you go through a window. But you go; you don’t give excuses of why you didn’t do something. I did that, and I spoke to the admiral himself, like, “Listen: I cannot believe they put me cooking for you.” He was, like, “What?” “I want to go on a boat.” He tells me, “OK, we have a deal.” He was almost crying. “Don’t tell my wife because she’s in love with you already. And one week before, I send you to the ship.” I said “Deal, admiral.” And I did it. I went in these boats six months sailing around the world. First time I saw the world away from where I grew up. It was fascinating and really changed my life in so many ways. I came to America, Pensacola, the five flags to celebrate. One of them the Spanish flag. I knew I belong here. In New York City of Liberty, coming under the Verrazano Bridge, Ellis Island, the beautiful American flags everywhere. I saw the stars and the beautiful night sky. Freedom. Everything is possible. I want to be part of the American dream. When I finished my military service a year later after working in Spain, I got an offer to come to New York. In case there’s an immigration officer here or any CIA ex-directors, I came legally. And here I am. Shontell: So you came with $US50 or so in your pocket? Andrés: I came with $US50, but that was the story at one time. How much money you had? $US50. But I was a lucky one. AP ImagesAndrés now owns 26 restaurants. Shontell: And you worked in a restaurant, but then you quickly realised you didn’t want to work in a restaurant. You wanted to do your own thing, right? And I followed his advice to heart. So I was able to move to Washington because I had these friends, partners, offer me to be the head chef, in 1993, of a Spanish restaurant. Shontell: And you’re in your early 20s at this point, right? Shontell: You’re really young; you’re head chef. Are you prepared? Or do you make lots of mistakes? Andrés: I had no clue how to run a kitchen. I was fired two or three times in the same restaurant, but I was way too charming to let go. Jaleo, again, was the moment that we would say to somebody, “I work at a tapas restaurant,” and the people will look at me up and down and say, “What do you do? You are the bouncer?” I’m, like, “What do you think?” Tapas, they will think it was something else. And then, like, “Do you cook? Is there cooking in that place?” Like, “No, tapas, man, tapas.” All right. It’s not a joke; it happened. And so tapas back in the day, nobody even knew what tapas were, and here we are so many years later, 25 years later. I was not the one bringing tapas, because tapas were here way before. The Spaniards have been in America for 500 years, people. But really, Jaleo, the restaurant we opened, kind of helped create the craze of tapas in the country. Shontell: But it is pretty impressive. You got Americans to embrace the idea of sharing their food. Andrés: Opening a restaurant that you had to share and the portions were small, everybody would tell me, “You’re not going to make it.” I’m, like, “Why not?” And at the end it happened that, yes, people like to share, yes, people like to try different things, unlike the steak and your mashed potato. But the small portion really is great. I mean, think about it. America is probably, without a doubt, one of the most generous countries in the history of mankind, and we should be proud of that. And we have a lot of countries around the world that indirectly help us. So I’m not too happy that I see that they are trying to cut foreign aid because I think it’s the wrong thing to do for my children and your children. So the sharing is something that I believe is part of what America is. So I saw that very clearly, and I thought tapas are going to be cool like hell. Shontell: How much of it, do you think, is talent versus perseverance, versus luck versus chance encounters? Andrés: Luck is important, but for you to be lucky, you have to be working hard at it. My dream was to have Michelin stars. I’ve been very lucky in life, but the truth is that those two stars were so cool. I cried very much but not so much for me but all my team, because your team is very loyal: they can be with you but they can be with somebody else. You’re only as good as the teams you have around you. We’re living in this life where now it’s like these celebrity chefs, we are so many now. It is better not to be a celebrity because there’s more celebrity chefs than chefs it seems these days. We are all cool people. Everybody wants to be a friend of a chef because, come on, just face it — if you are a friend of a chef, your life is going to improve in your eating habits tenfold. But you know, again, I live in a moment that my profession went to really be dark kitchens, long hours, super underpaid, under-appreciated, everybody. Now we have a lot of young kids and they want to be cooks; they want to be chefs. Shontell: So when you’re running a kitchen, what kind of kitchen do you run? Andrés: One thing I really tried to do, and you can see it in my office, is make the organizational chart more flat, more open, where everybody knows who everybody is, but I’m able to see across the room a person who probably will never have a chance to meet me and give me a good idea, such as: “The bathrooms in your restaurant are always dirty, José. What’s happening, and what are we going to do to fix it?” Anything. Big ideas, or detail ideas. This way, everybody feels a sense of ownership, feels that they can make a positive change, a positive improvement. And at the end, it’s use-added. Flickr/JMH’s Random ShotsHis restaurants are known for dishes like tapas and paella. Shontell: How do you encourage people who have good ideas but aren’t at the top, to kind of bring them to the surface and create creativity within your shops? Andrés: I don’t think it’s encouragement; it just happens. Things happen in a more fluid way. But the encouragement just happens in the everyday outcomes. We have walls full of ideas, and then other walls that are the ideas we choose to work on, and we have many walls full of ideas that maybe we think they are not making any sense but still we keep them because one day we may go back to them. So when you just make sure that the opinion of everybody counts, is just a natural process. Everybody is not afraid of opening their mind up because any idea may be a great idea. Any idea even that may sound very absurd, it is good that you create an environment that everybody will be at ease sharing ideas, and it doesn’t matter how crazy they may be or how absurd they may be. So me, I try to throw very absurd ideas, and what I love is when somebody challenges that, like, “Really? No way, José. This is not true. This is April Fools’ Day.” But that’s good because you create a very easy environment where everybody brings their best ideas forward. And that’s what we do all the time. Shontell: So how do you create a new hit dish? What’s the process? I mean, it’s a lot of experimenting, it’s throwing crazy things in the pan that you might not expect. What do you do? 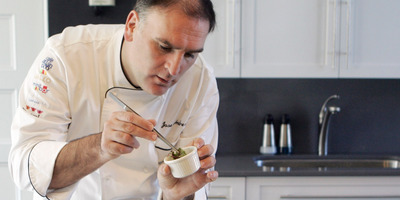 Andrés: People create the hit dish; we only create the dish. The hit is created by the consumer. If you work hard to create a hit dish, that dish may never be a hit. For example, the Philly cheesesteak. I made the best Philly cheesesteak in the history of mankind. The local Philly news, they did an editorial asking the government to take away my green-card rights because I did a version of a Philly cheesesteak that they thought was a ruse. But actually I improved the Philly cheesesteak. Shontell: What did you do? Andrés: We created a bread that is hollow, and if you throw it in the air it will fly. And then we made a warm cheese-whiz mousse, and we filled up that hollow bread with amazing mousse of warm cheese. Remember, mousses couldn’t be warm ever because if a mousse is warm, it would never keep. Now we’re able to do mousses that are hot or warm. Amazing. Then we put purée of onion, we put puree of green pepper. Then we got Kobe beef, raw, seared, thinly sliced. Then you put it on top of the bread. You’ll eat the Philly cheesesteak in two bites and your life simply would change forever. I’m trying not to overdo it. I know it doesn’t look very humble, but I’ve been as humble as I could be because it’s such a good dish. That was a joke. Shontell: As an artist, people are constantly judging your work. They’re going to taste that Philly cheesesteak and be, like, “Meh,” and you think it’s the best thing ever. I probably would love it but, you know, they feel like they can critique you all the time. So how do you develop a thick skin? How did you get that confidence? Andrés: By reading Yelp every morning of your life. Listen, actually, it’s amazing the world we live in, right? Because before we would have to be paying all these companies to do a report of how good or bad you were and send secret shoppers and now we have 7 billion secret shoppers working at your disposal and you don’t pay them a dime. So, yes, you have to develop a thick skin, but actually more often than not, people speak the truth, sometimes even negative comments, like someone comes to my restaurant, Jaleo Paella, and because the press and everybody expects the paella to look like Mount Everest with rice to the top, they expect to be full of things like chorizo — no, no, no — scallops and shrimp and lobster and the bigger mountain keeps growing. And the rice needs to be very yellow. It’s very important — you have to be always super humble in the criticism because you never know when you are on the tipping point of not being as good as you think you are. So thicker skin is something like, José the person, José the chef, inside me, I’m, like, “What the heck do those people think? Who are they? I don’t want them in my restaurant anymore,” which is good to have, but it’s good that you do that internally. You’re in partnership with them to a degree. They are your partners. When they invest money in your restaurant, they are your partner. So you want to believe that they have the best intentions when they tell you something. We cannot keep seeing the people coming to our business as the guests or the customers: They are our partners. They don’t know it, but we need to take them like they are the best partner we have out there. And then the business model changes completely because you don’t see what they say as bad criticism but you are trying to see if there’s a partner that is trying to make the business better. And then is wonderful the things you can accomplish. Shontell: So one thing that you’ve launched in the past couple of years is called Beefsteak. You want an alternative to the way people are eating right now, which is like Chipotle and things like that. Tell me about the message behind Beefsteak and why you think it’s important and what’s happening in that trend. Andrés: So beefsteak is a vegetable concept. I love beefsteak because they are tomatoes. It’s a name I was fascinated with. I’m like, “I’m sure if I open a vegetable concept, I’m going to call it Beefsteak: vegetables unleashed.” And we create vegetables that they are not good for you, they’re not healthy. Vegetables are tired of us telling them “how healthy you are, how good.” No. I create a universe of vegetables that they misbehave. They run over 55 mph. They are behind the chickens with forks and knives. The eggplant is with Walkman and the headphones walking in the street. Carrots, they are naughty and they are eating the steak. I create that crazy world of vegetables. So we are trying to make vegetables affordable, and that’s the concept we created. It’s kind of a Chipotle line where you go, you choose your vegetables, you choose your toppings, you choose your grain, you choose your dressing, can be a salad. We have a beefsteak-tomato sandwich. I had to. We have a beet sandwich. So we have a celebration of vegetables. Do I hope I’ll have 100, let’s say, 50, in the next two, three years? Yeah, we hope so. Hopefully by the end of the year we have roughly between 12 and 16. My partners wanted me to open up fast food that had something to do with hot dogs or burgers or something like America actually likes. It’s not easy to sell vegetables, but guess what? We have lines and we put it in the Verizon Center where the Wizards play, the NBA team, and it probably was the first time ever that an arena had a 100%-vegetable concept. And was amazing to see the lines we had. Now, next month, I got a place downtown DC, and I’m going to start testing fast-food concepts. So over the next two, three years, I’m going to be testing roughly six, seven fast-food concepts. Like, it’s my research-and-development place. Why? Because if I hit the one concept, I’m happy. I say the chefs like me, we feed the few, but it’s necessary that we get involved in feeding the many. We cannot be complaining about how bad the food is in some parts. We need to stop complaining and do something about it. So Beefsteak is just my trying to say, I can try to feed the many better, this is my little contribution. I may fail, I may succeed, but Winston Churchill, I think, was the one who said that success is going from failure to failure without losing enthusiasm. And as you can see, my boys and girls, enthusiasm is not something we lack in DC. So that’s what we do, trying to be successful. But if we fail, it’s something we learn. 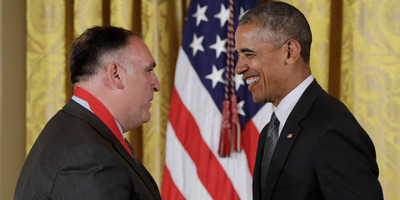 AP ImagesBefore clashing with Trump, Andrés was awarded the 2015 National Humanities Medal by President Obama. Shontell: You’ve been in headlines recently for other reasons. You were supposed to open a restaurant in Donald Trump’s new Washington, DC, hotel and, after he made some remarks about Mexicans, you pulled out. And now you’re in a lawsuit. What drove you to do that? And what’s it like going against now the president? Shontell: So how do you decide when to make a bold call like that and support all of your employees? You did it again when the travel ban happened. You closed your restaurants for a day, some of them. Andrés: Listen, my wife and I, we became American three years ago. I got to tell you, nothing made us prouder and nothing made us happier. We swore in at the Supreme Court with Sonia Sotomayor, Antonin Scalia, who I knew very well, and I had many oyster contests with him and I miss him dearly — and those oyster contests. He was super-smart, witty guy. But life, we are in this moment where restaurants, food business, we are drawn into, without realising, into political talk. But this is the reality. My business, the restaurant food business represents over 10% of America, the GDP is over probably 12%, 14% if we include everything — farms, restaurants — it’s a huge number. Employees are 12%, 14% of American. And today, it’s a simple reality — we’re talking immigration. Let’s face it, people — probably around us are people who are undocumented right now. No organisation, no country should have people who are undocumented. We should run the country following the laws of the land. The reality is that 70% of the workers in the farms of America are undocumented. So the salad that my senator, my congressman is having in the Hill is probably being harvested by an undocumented. And this is the big lie we’re facing: that those people should be part of the American dream. They should because they are already part of the American dream, and my family is having a better quality of life because we have those undocumented providing the salad that my children eat. I’ve been very outspoken about immigration reform. It’s not a problem for America to solve; it’s an opportunity for us to seize. So everybody tries to make it political. President Bush and President Obama, two beloved presidents who did a very good job with their ups and downs, pros and cons, but two beloved American presidents, both tried to pass immigration reform, and both had more or less control of Congress, and both couldn’t make it happen. That’s a direct disservice to America. Because right now, we have positions in my restaurants paying 15, 16, 17, 18 dollars an hour. I cannot fulfil because I don’t have employees. I tried to hire people out there. It’s almost impossible. So it’s not allowing me to grow maybe at the faster pace I would like. So Congress owes the American people because they think it’s the right thing to do for America and the right thing to do for those 11 million undocumented to come up with a way to make them keep being part of the American system. I’m an immigrant and I’m a proud American. I know where I come from; I know where I belong. But I do believe the biggest contribution today Congress can be doing to every single American is a true, comprehensive immigration reform, that yes, we control our borders. But yes, we give opportunity to American businesses like mine to keep growing because we will have a workforce that is already here.